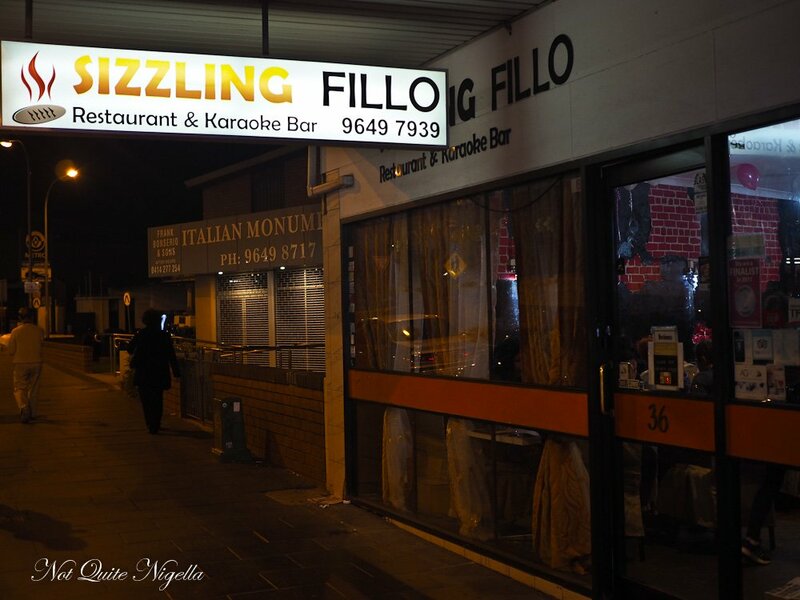 It's a Sunday night at Sizzling Fillo restaurant in Lidcombe and it's fairly busy. The walls on one side of the restaurant have painted red bricks with blacked out areas. A wedding altar stands at the back of the karaoke stage. 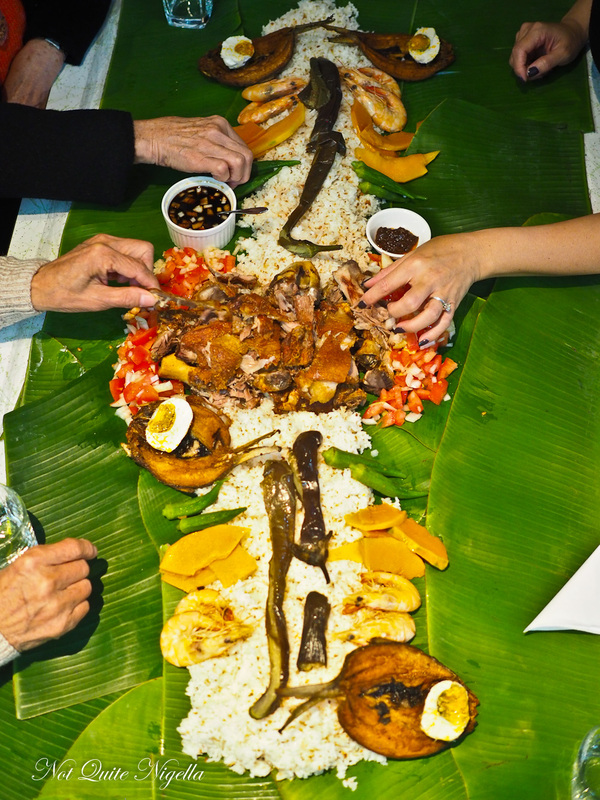 There's a woman wearing a tiara and sash at the head of a long table spread with banana leaves. Her table is laid with a boodle feast. So what is a boodle? 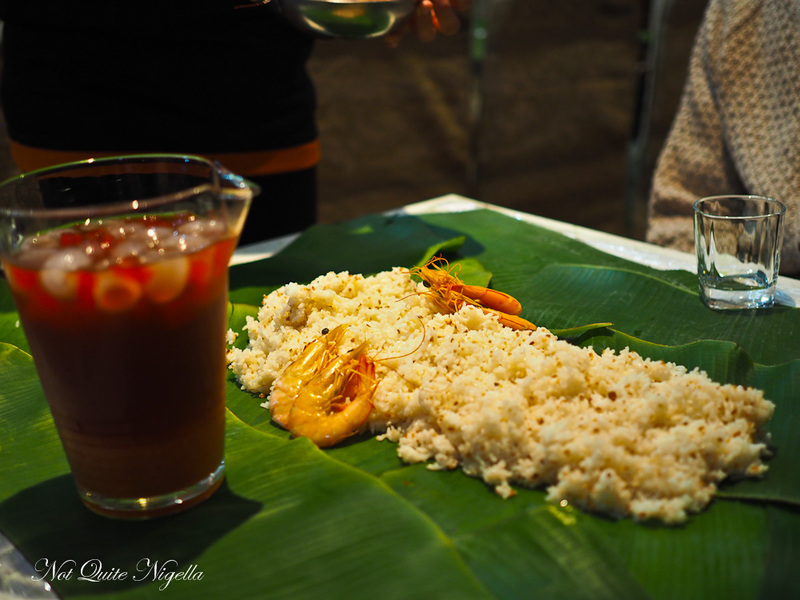 A boodle or a "boodle fight" originally started with the Filipino army as a military style of eating. It was a way for soldiers of all ranks to share food together. It comprises of rice and a medley of fish, pork (crispy pata) and vegetables and it is all eaten by hand. Traditionally one stands when they eat but it has evolved to becoming a restaurant style of meal. 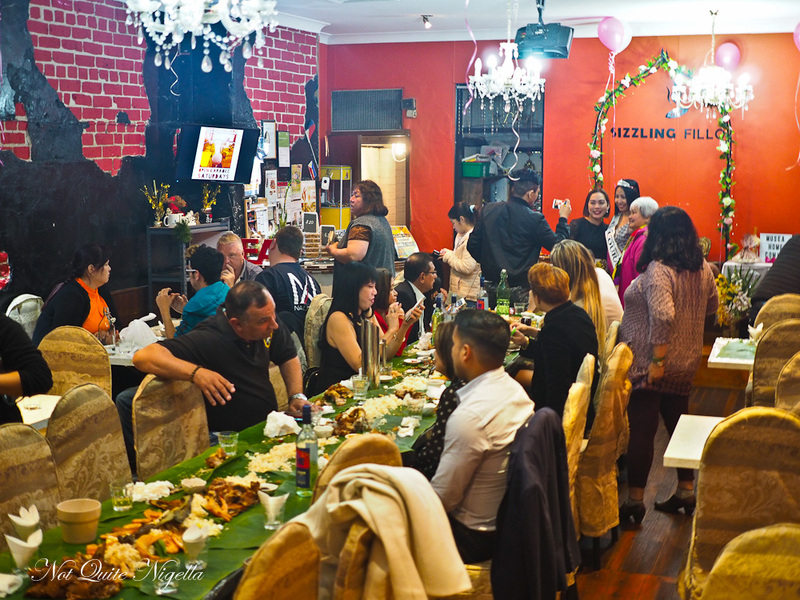 The boodle meal option at Sizzling Fillo needs to be booked ahead of time. 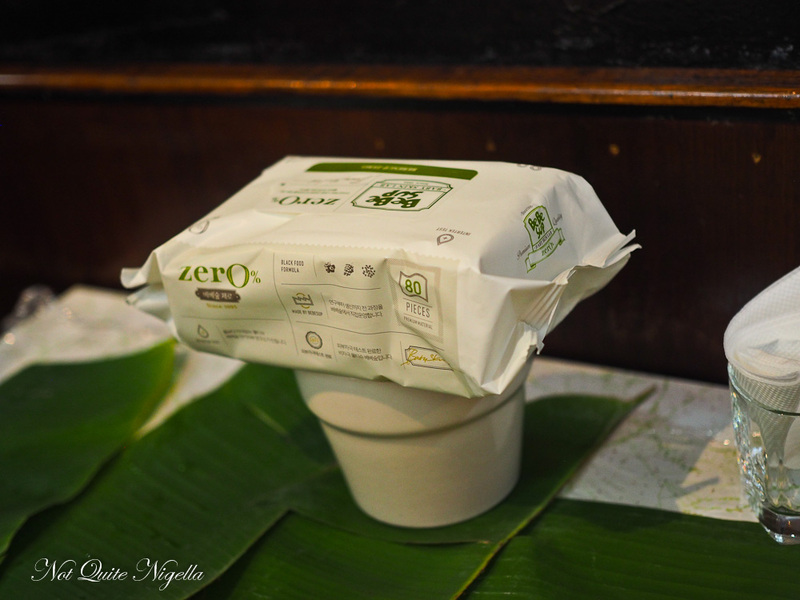 Tables have a layer of cling film underneath the layer of banana leaves and there is a box of wipes to wipe your fingers with before you start. There are two boodle meals available: one that comes with dessert and one without. Although we ordered the one with dessert and drinks, I'd recommend ordering the one without and then choosing your own desserts and drinks. It's better value with a table of four and also you get to choose your own dessert. The staff are very friendly and lovely. "Are you ready?" they ask and we are indeed. We start with a jug of Sagot Gulaman. It's a very sweet drink made with jelly and a sago at the bottom. Everyone else really likes this but I'm afraid it's a bit too sweet for me. The syrup is caramelised giving it a very sweet, date-like flavour. 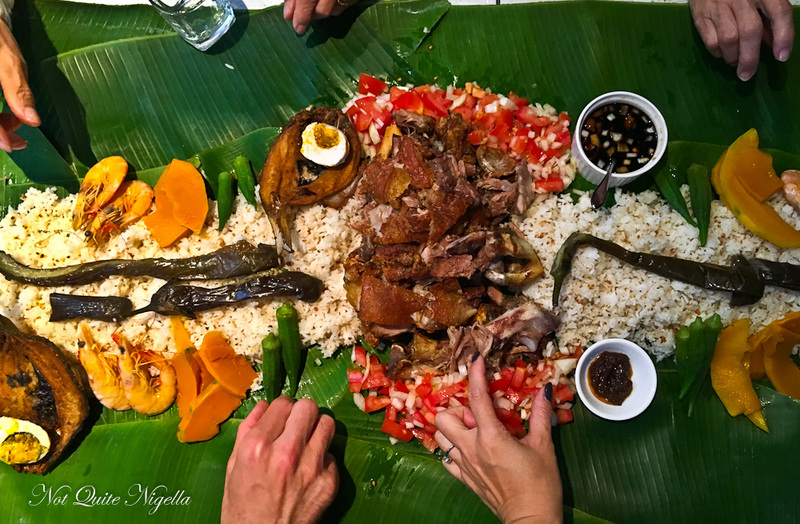 They start the boodle by laying down garlic rice in the centre using gloved hands and then they add crispy pata or pork in the centre of this. For those that haven't tried Filipino food there are two things that I was told by my Filipino friends: sweets are very sweet and they also love pork and crispy pata is one of their favourite ways to eat it. Crispy pata is twice cooked pig's trotters or knuckles with a crunchy crackling and soft meat. It is first simmered until the meat is soft in a mixture of vinegar and Sprite or 7Up and then deep fried. It is served with the bones. If you love crispy crackling you'll love it. After this they add the deep fried Daing or baby milkfish, two prawns per person, slices of cooked pumpkin, half a salted egg each, okra and a tomato and onion salad. There are two sauces: a thick, pungent fish paste for the vegetables and a soy vinegar dipping sauce for the crispy pata. We dig in with our hands. The garlic rice is fantastic, especially with the pork and the vegetables offer a nice respite from the heaviness of the crispy pata. The milkfish is crispy fried and you can eat the bones too. The tomato salad is fresh and the salted egg is very salty. Try as we might, we can't finish it all. In fact we can't even finish half of it. Not wanting it to go to waste, we end up with two huge styrofoam boxes to take home with us. Other tables do a bit better than we do so it is possible to finish most of it (bar the rice because there is so much of it) but you perhaps need to arrive famished. They wrap up the banana leaves using the cling wrap as a bundle and the table is clean again and it's time for dessert. 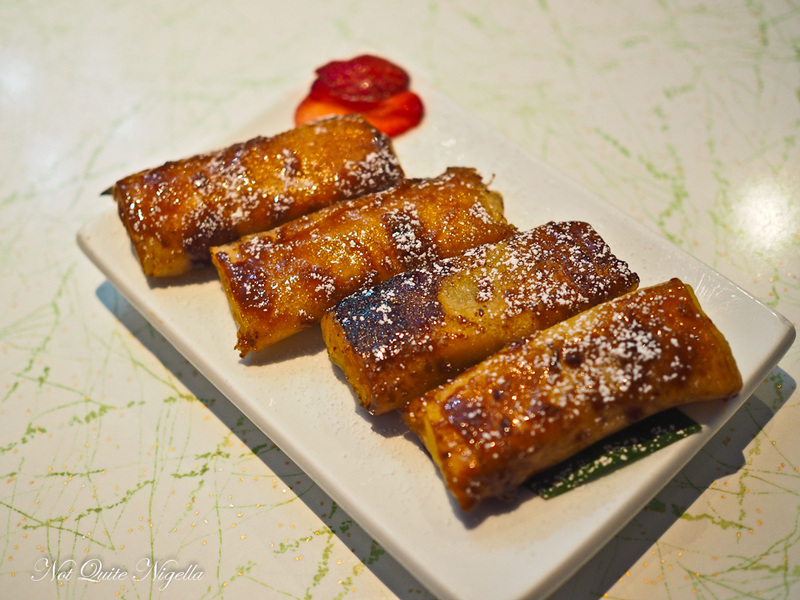 The dessert included in the meal are turon or lumpiyang saging or deep fried bananas and jackfruit wrapped in spring roll wrapper pastry. The outside of the pastry is caramelised and crisp and the banana is a slightly drier version of the bananas that we are used to. I believe you can buy these frozen. 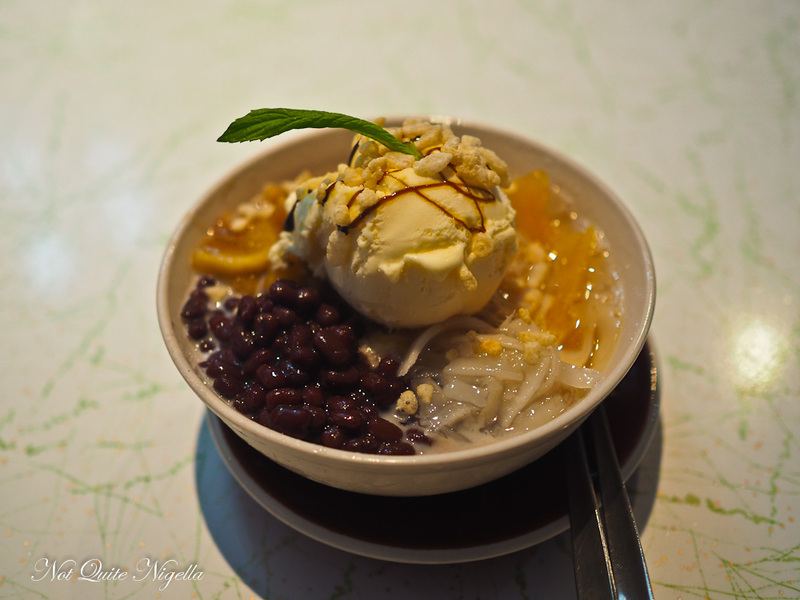 We also decide to order the halo halo, a shaved ice dessert with the addition of jelly, beans, palm seeds, mango, coconut strips and a scoop of ice cream. I prefer this dessert to the bananas as it is refreshing and we bid adieu before the karaoke starts. So tell me Dear Reader, do you like eating with your hands? 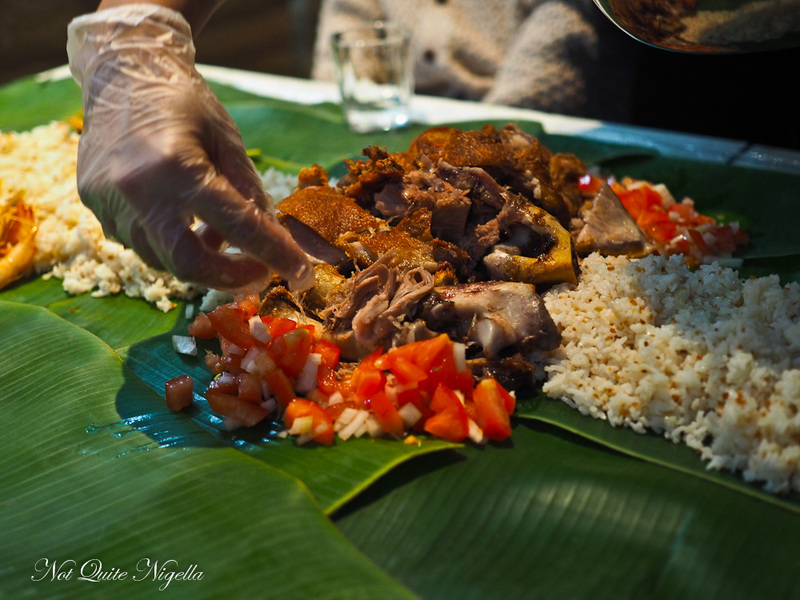 Have you ever had a boodle or Filipino food? restaurantA Moveable Indian Feast at Harris Park! restaurant A Moveable Indian Feast at Harris Park!